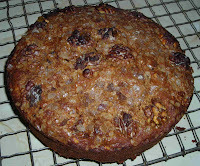 This is my version of Rosie's Cake, you can see the recipe on her blog Rosie Bakes a Peace of Cake . I didn't have any Calvados, Pecan Nuts or Demerara Sugar as required by the recipe, so I used dark rum, walnuts and those big crystals of brown sugar you use for coffee or on top of muffins - they tend to break your teeth, so I don't use them much - I crushed them with my rolling pin so the bits were less lethal! It took an extra 10 minutes in my oven and I should have covered the top with some baking parchment at that point because the walnuts are rather 'well-fired' (I never burn things- ha, ha, ha). Anyway, we had it warm for pudding with lovely vanilla icecream and some of the leftover stewed apples from yesterday, it was fab. Your cake came out lovely and Rosie will be really happy ;o) I have linked you to my blog and i have posted the recipe for the Banana Butterscotch Loaf on my blog for you and anyone else. You have really made my day here and I feel very privileged indeed here :) Your cake looks superb and oh my served with vanilla ice cream and stewed apples mmmmmmm delicious combo!! That looks so delicous! I would love a piece!